This is an instrumental track. Instrumentation includes keyboards, synthesizers, spacey drums, bass, sound effects and sound design. Investigative tension, suspense, plans and preparation, sneaky activity, underworld goings on and spying are all apt imagery for this mischievous track. 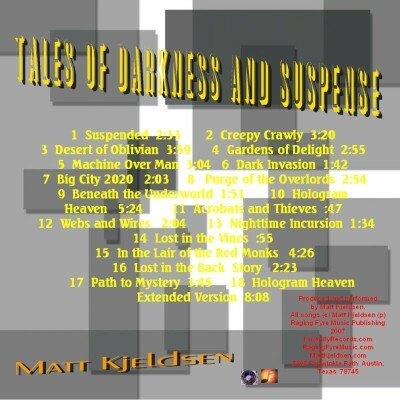 Tales of Darkness and Suspense (2007) creates the feeling of several short horror/suspense films pieced together as a soundtrack. Scary and dark and very effective.